Imagine the memories your family and friends could create on a getaway to historic Astoria, with its parks, museums, theatres, shops, galleries, and restaurants, plus events like August’s Regatta and the Great Columbia Crossing in October. Then imagine their enjoyment when they stay at Clementine’s Bed and Breakfast, in the heart of the historic district. Our intimate Victorian inn, gourmet breakfasts, picturesque gardens, and most of all, our warm hospitality will become memories for years to come. Just think what the extra value can add – our Birthday or Anniversary Package ($65), tickets to a show at the Astor Street Opry Company, a souvenir from one of Astoria’s many galleries – the possibilities are endless! 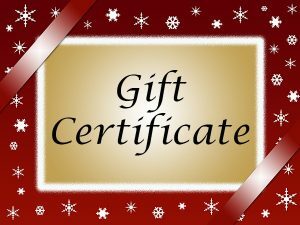 A Gift Certificate for Clementine’s Bed and Breakfast is the perfect gift of treasured memories, so let us help you with your shopping this holiday season. Just complete this form, and we’ll do the rest! This entry was posted on Friday, December 9th, 2016 at 1:46 am and is filed under Clementine's Bed & Breakfast News. You can follow any responses to this entry through the RSS 2.0 feed. Both comments and pings are currently closed.